Sturdy and reliable scale made of galvanized steel for long service-life.It’s constructed to be used, both on the farm and in the field. The scale can be fitted with an electronic ear-tag scanner for automatic identification of the individuals. When using electronic ear-tags you will be able to automatically record the ID and the weight. The record is kept on a USB-drive for easy transport of the data to the Farm-PC. A cattle head gate can be fitted to hold the animal in place during treatment. All 4 sides are fitted with gates. This way sorting the animals in 3 categories is easy. Sorting can be done based on weight or individual parameters (via the ear-tag) stored on the USB-drive. Made of galvanized steel and fitted with electronic instrument. 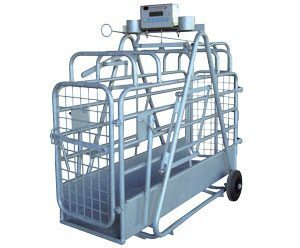 The mobile pig-weigher is equipped with an electronic instrument to which a ear-tag scanner can be connected. Both gates can be operated from one end, making it true one-man operated and very efficient. A electronic ear-tag scanner can be mounted to facilitate automated / manual recording of the individual – ID and weight. A build in battery supplies both instrument and scanner. The instrument can perform sorting based on weight and individual parameters (via the ear-tag) stored on the USB-drive. 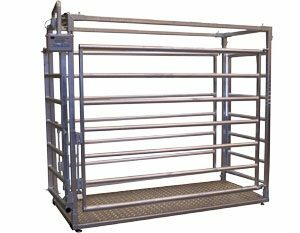 The mobile crowding pen is a very efficient tool to catch, to work and to weigh your cattle. It’s made out of galvanized steel. 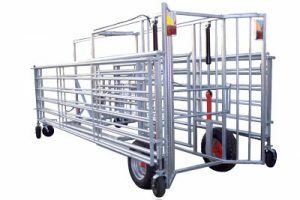 The transport wheels are hydraulic operated and the foldable fence can be operated by just one person due to spring-loaded wheels placed on each section. The crowding pen can be supplied with 2 x 2 – 2 x 4 sections – each 5 m wide. It’s equipped with lights and reflexes for transport on public road. A electronic scanner for reading electronic ear-tags can be attached. Thus both weight and ID of the individual can be logged. The logging is made on a standard USB-drive to facilitate an easy interface to a PC. The logfile is a standard excel compatible csv file.